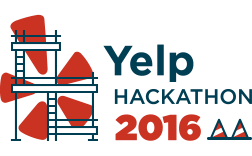 Welcome to Yelp's very first online hackathon! There’s never been a better time to build something new and awesome with Yelp’s API. Consumers rely on Yelp’s trustworthy ratings, reviews, and accurate business details to make important decisions every day – finding a place to eat, selecting a handyman to help them fix up their home, or uncovering the best place to buy a gift. If you like to think big, hack hard, and dream better, this is the contest for you. Show us what the next generation of cool apps and websites look like — or the next generation of wearables. We are excited to see what you can develop on our platform. Prizes will be awarded based on originality, user experience and effective use of the Yelp API. For documentation on the Yelp API, check out the Yelp developer site. To start, please follow the instructions on the "How to Enter" section of this page. Note: We accept any original mobile app or website. If you're developing for iOS or Android, your app does not need to be in the App Store or Google Play. To enter an app that isn't in the App Store, use iTunes Connect to invite hackathon@yelp.com as a beta tester. To enter an app that isn't in Google Play, upload an .apk file on the Enter a Submission form or provide a link for downloading the Application in the “Testing Instructions” field on the Enter a Submission form. Submitters who are employed by Yelp or DevPost are not eligible. Create an app or website that uses Yelp's API or update an existing app or website with the Yelp API (added after the start of the submission period). Be a new application, or, if an existing application, must have integrated Yelp after the start of the submission period. Submitters must include the Email account connected to Yelp Developer account, AND the Consumer Key for Yelp Developer account on their submission form. For a complete list of requirements, please read the Official Rules. Click the "Register for this hackathon" button to sign up, receive important updates communications, and form teams. Sign up for a developer account on the Yelp developer site to get started. Visit our resources page to get all the necessary documents and resources you need to build your app. Submit your project by clicking "Enter a submission" button. Is the application unique and/or innovative? How creative is it? How well does the application utilize the Yelp API?